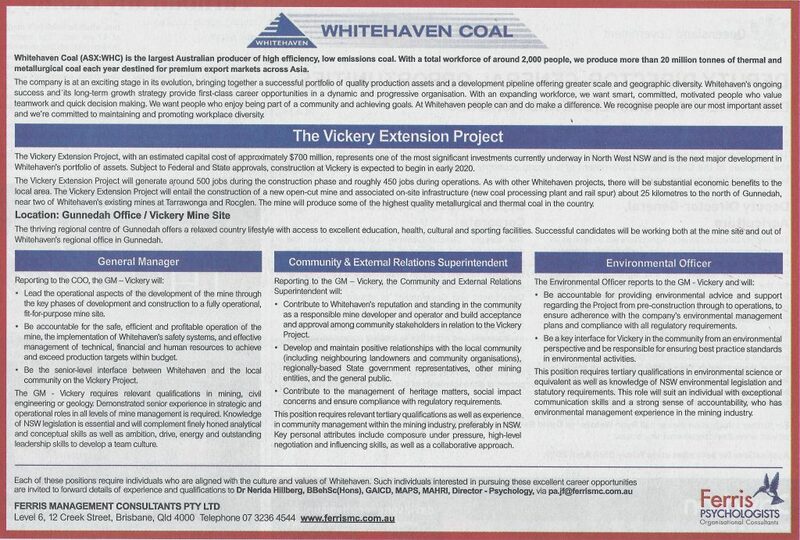 Whitehaven Coal has undermined confidence in the NSW planning system in relation to the proposed Vickery Coal Hub project near Gunnedah, by starting recruitment for three senior positions in the proposed megamine complex on the Namoi River. The company has pre-judged the NSW IPC by engaging Brisbane-based Ferris Psychologists to recruit the executives “subject to Federal and State approvals, construction expected to begin as early as early as 2020”. The characteristically audacious job advertisement for the non-existent top jobs contradicts reports by commodities analysts FN Arena @fnarena following last month’s Quarterly Report: “The plans for the Vickery have been pushed out to FY21 and the company has highlighted a likely legal challenge to the mine”. This may be a reference to the decision in the Rocky Hill Coal Project Gloucester Resources Limited v Minister for Planning  NSWLEC 7 and the likelihood that similar arguments related to greenhouse gas emissions could be brought successfully against the proposed Vickery 10 Million Tonnes per Annum megamine. Whitehaven Coal has asserted itself over the NSW Independent Planning Commission, trivialising the huge questions surround Whitehaven’s expansion aspirations in the Namoi Valley. Currently the company claims it is running out of water, and threats of production slow-downs and lay-offs have been circulating since the beginning of 2019. There is a great deal of uncertainty among the community, including employees, about how long the company’s nearby Maules Creek and Tarrawonga mines in the Namoi Valley can continue to operate in the circumstances. 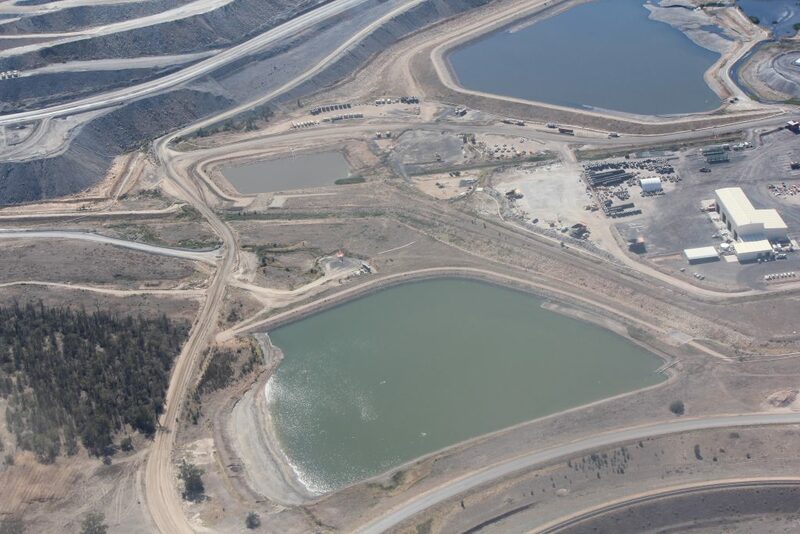 The claims of running out of water are contradicted by latest aerial photos showing that Whitehaven’s Maules Creek mine is actually hoarding water, and the level of water stored in their north-eastern pit is considerably higher than before November. 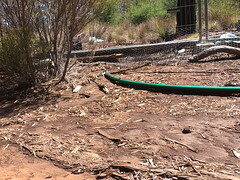 Visual estimates suggest over a gigalitre of water is in the pit alone. Whitehaven’s confidence in its ability to construct the Vickery Coal Hub – including the open-cut mine, a coal washery and processing plant for 14 Million Tonnes per Annum, and a network of rail spurs across the flood plain – is viewed otherwise by coal industry-watchers, who cite the international market for coal on the one hand as being an inhibiting factor and the deficiency of its Environment Impact Assessment which it is required to resubmit following a highly critical submission by the NSW Environmental Protection Authority and the absence of floodplain modelling. In reality, the Vickery Coal Hub is looking increasing unlikely. 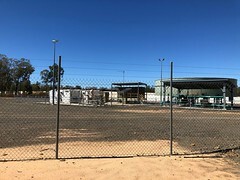 The additional costs of the water troubles at Maules Creek mine were highlighted last month when Whitehaven was successful in a bidding war against Japanese Idemitsu Resources over nearly a gigalitre of groundwater entitlements in the area, which took the price per megalitre from the usual $100 to $930. 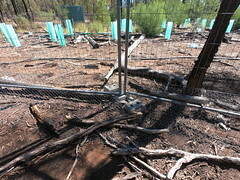 See Prime 7 story here. 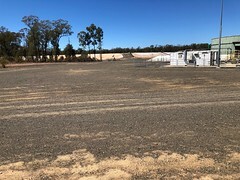 In terms of process, the miner still hasn’t even responded to submissions and arguments put forward at the IPC hearings which were held in Boggabri and Gunnedah on 5th and 6th February 2019. The process has a long way to run. Conducting a beauty parade for jobs that don’t yet exist is not a good look for Ferris Consulting and Whitehaven.